Forum Index > Historical Arms Talk > Why do reproduction warhammers have square shafts? Posted: Tue 04 Apr, 2017 3:22 am Post subject: Why do reproduction warhammers have square shafts? 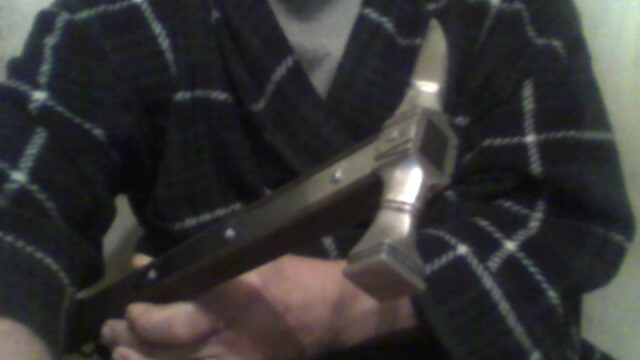 Most modern reproduction medieval war hammers have square shafts which are not very ergonomic at all. A more rectangular shaft would be much more comforable or even better some kind of stretched octagonal section. I understand it's pretty rare for wooden shafts to have survived from this period but do the fittings from surviving hammer heads suggest a square shaft? And if so why would that mean it was square all the way down? That sounds right, but he's asking - why not rectangular? why square? Which do the metal fittings suggest? I don't know much anything about war hammers, but a quick google image search turns up a number of (what appear to be) originals with surviving handles, some made of metal and some of organic material that must have been well cared for or replaced. Just from the first few one could see a variety of cross-sections from square to rectangular to perfectly round. Why do modern replicas tend to look alike? Pure speculation based on other examples: what I suspect happens often with modern reproductions is that someone comes out with a model first based on a well known, accessible piece, and then the entry-level manufacturers end up imitating this repro rather than doing the due diligence to do heir own research on originals. Why 'professionals' would do that escapes me, since its not that hard to at least look at some pictures and overall measurements on-line or in books, and derive some other measurements yourself, even if you can't get exact measurements from the museum or collector. I've done that myself several times for custom pieces and they came out pretty successful in most cases - and I'm just some guy sitting at home in my family room.